March found Nest Guild members tuned in live from around the world as West Elm President, Alex Bellos, spoke in with Diego Olivero, Co-Founder of Guatemalan-based artisan business Meso Goods, and Rebecca van Bergen, founder of Nest. The dialogue, which offered strategies for how to build successful artisan-brand collaborations, kicked off the first broadcast in a new Inspiring Leaders webinar series for Nest Guild members, which will be followed by a conversation with CFDA President, Steven Kolb, in May. With the new webinar series, Nest seeks to inspire artisan entrepreneurs to learn from exceptional leaders who have shaped and grown businesses, organizations, institutions, and social enterprises with ties to the handworker economy. 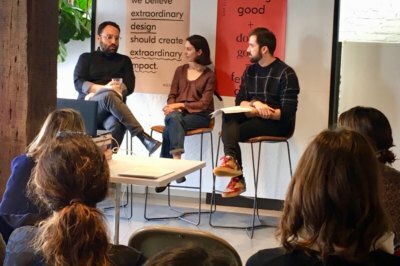 In addition to drawing more than 40 digital sign-ups from artisan leaders around the world, the talk invited a live audience of New York-based Guild member “makers” to hear from the trio of experts in person. In a sun-filled room in the West Elm headquarters, overlooking the Brooklyn Bridge and Manhattan skyline, we gathered for an evening replete with insights into the guiding ethos and practical logistics that drive exceptional collaborations between small artisan businesses aspiring to work with a major national retailer like West Elm. A Nest Artisan Guild member himself, Guatemala-based Meso Goods Co-Founder Diego Olivero recounted the first order his business received from West Elm – a large order for handwoven pillows that he was unable to entirely fulfill. How has one short order grown into a multi-year partnership? Both Alex and Diego agreed that open and upfront communications are keys to establishing trust, troubleshooting issues together, and ultimately bringing beautiful handmade products to market. When probed as to his first encounters with craftsmanship and how they’ve informed his vision for West Elm’s ever-expanding handcrafted offerings, Alex resurfaced his early travels to Japan, marked by a master makers whose loyalty to family tradition and commitment to requisite iteration, led him to add one small groove to each of the ceramics he crafted. The action, of small scale yet great significance, and made an impression on Alex that reached beyond the craft form itself. With West Elm having recently released the Nest Seal of Ethical of Ethical Handcraft on select handwoven rugs made in India, Alex and Rebecca gave the audience greater insight into the Nest Standards and process for helping artisans move on a path to ensuring practices that ensure worker visibility, rights, and wellbeing, even in a home or small workshop setting. Together, they emphasized that the future of craftsmanship lies in uniting time-honored techniques with new product applications through creative design and out-of-the-box thinking. The conversation is now available to the Nest Guild network reaching more than 500 artisan businesses across over 90 countries, as a recorded video clip that can be downloaded through the Nest Connect learning hub. Know an amazing artisan business that could benefit from joining the Nest Guild community? Email us at artisans@buildanest.org!